A federal court jury in Detroit unanimously found in favor of Foster Swift’s client, an internationally recognized manufacturer of custom sports equipment. The complaint in the case alleged that the client’s former production manager and former outside sales agent, while still engaged by the client, had established a directly competing manufacturing and sales business, in breach of their fiduciary duties and duties of loyalty. The complaint also alleged violations of federal trademark law (false designation of origin), unfair competition and civil conspiracy. After a ten day trial in September 2014, the jury awarded Foster Swift’s client substantial monetary damages against the individual defendants, and against entities that each of them had formed, upon hearing evidence that they had misappropriated and used the client's corporate name, manufacturing patterns, vendor pricing lists and raw materials to establish their competing enterprise. Just ten months after the production manager and sales agent had parted ways with Foster Swift’s client, their plan came to light. The sales agent was quoted in an on-line sports magazine article. 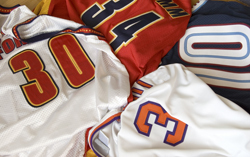 The article showed a famous athlete wearing unbranded sports gear that the sales agent claimed he had made for the athlete’s upcoming play season. The featured product bore a striking resemblance to product designed by Foster Swift’s client. Following publication of the magazine article, Foster Swift attorneys began to investigate. They obtained products sold by the defendants and discovered in them raw materials that had been specially sourced by the client, as well as specialty parts manufactured by the client. Photographs of the client’s product, undergoing conversion at the defendants’ manufacturing facility, were also discovered. Foster Swift obtained additional information regarding the interview for the magazine article. It established that the defendants had formed an exclusive manufacturer-seller relationship, that they had already manufactured over one hundred such products, and that the sales agent had also obtained a number of the client’s current products and “cut the labels off it…and put it on” the defendants’ products. Foster Swift’s client testified that it would have been impossible, in the short period of time between the defendants’ departures and the magazine interview, to have made the quantity of product referenced in the interview, without the use of the client’s detailed patterns, supplier information, and specialized dies and production machinery. Shortly before the defendants' departures, copies of the client’s job detail and production pattern book and its raw materials vendor and pricing book had disappeared. After the complaint in the case was filed, it was also discovered that the production manager, while still employed by the client, had begun purchasing expensive manufacturing equipment. He had also purchased raw materials for his competing business using different, unregistered business aliases. Foster Swift uncovered that the production manager and the sales agent had been operating a sports equipment modification side business for several years, and that they had been sending orders and finished products to one another in the name of an individual who had been dead for more than 15 years.